This entry was posted on September 1, 2017 at 6:00 am	and is filed under weapons. Tagged: balance, characteristics, design, fighter aircraft, fighter design. You can follow any responses to this entry through the RSS 2.0 feed. You can leave a response, or trackback from your own site. Can’t we use a pair of IRST sensors as a rangefinder, like in the older designs before lasers? Of course the matching of the objects on the two images would be done by a computer algorithm now. It is a good idea. But for best efficiency, said IRSTs should be on wingtips, which limits aperture size and thus range. 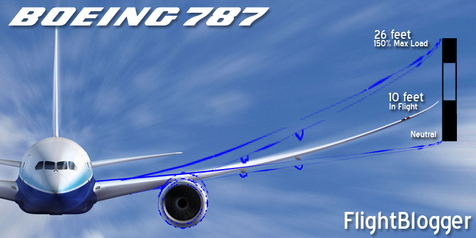 This would create issues due to wings flexing in flight, meaning that relative positions of IRSTs will change. It should still allow enough accuracy for engagement, though. Other possibility is triangulation via datalinks between multiple fighters. Or maybe using one big IRST for long range detection in the forward hemisphere and multiple IR MAWS for short to medium range spherical detection with the IR MAWS deployed in such a way that every possible direction is viewed by at least two IR MAWS or one IR MAWS and the IRST. Even if the IR MAWS don’t have the same detection range as the IRST, once the target has been detected by the IRST the computer can matched with the images from the MAWS and triangulate for range. If a heat sources is beyond the detection range of the MAWS it does not mean that the MAWS can’t “see” it just that the image is not clear enough to identify it. Once the IRST has confirmed the detection, the heat source detected by the MAWS that corresponds to the direction of the target identified by the IRST can be used, thru sensor fusion, for triangulating range. According to Thales the angular accuracy of their DDM-NG MAWS installed on the Rafale is enough to allow DIRCMs to be aimed at incoming infrared missiles. Since DIRCM is basically a laser, that has to hit a fist sized target at about 10km to actually be effective, I suppose that if the angular accuracy of DDM-NG is enough to guarantee such a hit, it might be big enough that unidentified heat sources at 100 km might fall into an uncertainty range no bigger then the aircraft itself, then I suppose the binocular ranging error when working with the IRST might be no bigger then 1 km. Since a single DDM-NG sensor can cover a whole hemisphere by itself then for what I propose 4 would be more then enough, and would leave just a small sector directly bellow the aircraft covered by just one MAWS. -Have exactly the right ratio of planes with podded radars, to planes without. So experimentation may find that 100:1 with/without ratio is best, or it may find that 10:1 ratio is best. -You don’t ruin the weight and aerodynamics of every plane, the noses are sharp, the planes are light, and only one plane in a group (of size determined by experimentation), has to hang back and act as a sort of AWACS, suffering the weight and aerodynamic penalty. Really this seems like a decision with absolutely zero drawbacks. Not seeing the downsides at all here versus radars in every plane, and I think that there’s a lot to be said for at least giving the pilots/aircrew the option of having a radar in their loadout that is tailoured specifically for their mission. I just went back and looked at your Air Superiority Proposal – 6, and I see you included a pylon for radar, so I suppose that you’ve thought of this before. I have included radar pod for FLX 6. That being said, internal radar does have a benefit since it can also act as a giant RWR, if properly designed. Larger aperture means far greater sensitivity, as well as better directional accuracy. But I’m not sure current radars have that option. That is why I was thinking about FLX 7 with radar included, but problem is time I will need to design it. But don’t RWR’s have an enourmous advantage in detecting enemy radar? So as far as I’m aware they don’t need to be big, because of the combination of the inverse square law and the tiny percentage of radar that gets shot back at the exact right angle to the enemy radar. True. But a lot also depends on technology used on both ends, as there are ways to make radar less detectable. In fact, LPI techniques were known and in use since World War II (frequency hopping). Now that I think about it more, can’t you just use the radar pod as a RWR itself? It is a possibility, but you need more than one RWR antenna for range finding. I also have a question with regards to Dynamic Instability. So I understand that regular planes for civilian use have stable designs. The only way I see this is in the wings, which are slightly angled upwards. This means that when the plane turns, the lowered wing is at an angle to generate more lift then the upper wing, which means that the plane wants to (gently) rock back to level flight. I looked at the picture of your FLX by Riley, and I can’t tell if it was just his impression, but it looks like the wings are actually pointing downwards at a slight angle. If so, is that to increase the instability, so that the plane rocks even harder into the turn? Secondly, I think I’m starting to understand why canards are much less stable than tail fins. When you point the nose up, then the tail fins are now generating lift as well, which pushes the tail upwards, and levels out the plane. Same is true for when you point the nose down, the tail is now generating reverse lift (not sure what the technical term is), which pushes the tail down, and levels out the plane. So if my understanding is correct, then that’s why fighters have nose canards (again I’m not entirely sure the technical terms), because then, when the nose is pointed upwards, the canards generate lift to accelerate the nose lift, which pushes the plane even harder upwards. Same is true for pointing the nose down, or side to side, all of which combines to make the plane more maneuverable in the air. Unfortunately I don’t know any aeronautical engineers, and Google has it’s limits for sure. If I got something wrong here I’d really like to know. Anyway, to expand upon my last comment, if I indeed have figured this stuff out, and aren’t making any mistakes, then the weight of the plane is quite important to its stability, or rather, the weight distribution of the plane is very important to its stability. If we have a plane with the same aeronautical design, close-coupled canards, slightly down angled wings, then if we have more of the planes weight distribution in the nose, then it’s going to have worse maneuvering performance, and effectively more stability. Because the farther forward the weight of the plane, the less it can “whip” around its nose, because there’s less leverage over the wings. Now that I think about it, that must be part of the reason why it’s so important to have a skinny nose, the fatter the nose the more drag there is and therefore the more resistance there is to any turning (as well as general drag). So the first question I have is that am I correct in thinking that the nose of the plane should be as light as possible? Secondly, is there any limit to the benefit of dynamic instability? Basically, is there some optimal point, where after that point you lose out on something, or is it something that should be maximized, assuming that you’re not losing anything? I can imagine that wings pointing 45* downwards would probably kill your lift for instance, but I’m refering more to the weight distribution. Yes, you are correct (I explained it in my last comment, before I saw this one). But nose width has little to do with it, in fact, if nose is of a lifting design, a wider nose may even improve maneuvering performance by adding lift ahead of C(g) (center of mass). But yes, the nose should be as light as possible. Wings pointing downwards has nothing to do with instability. And there is a limit – ability of Flight Control System to compensate. Because if it cannot compensate for aircraft’s instability, the aircraft crashes. Aerodynamic stability is determined by relationship between the center of lift and center of mass. If you take a look at unstable aircraft, all of them have wings relatively forward, or else have canards. Either of these options moves center of lift forward. And since FLX has no radar, center of mass is slightly further back than with most other designs. What you are thinking of here is roll stability. Whereas former is determined by horizontal relationship between center of lift and center of mass, roll stability is determined by vertical relationship. And this depends on the vertical position of wings, and the angle of wings. 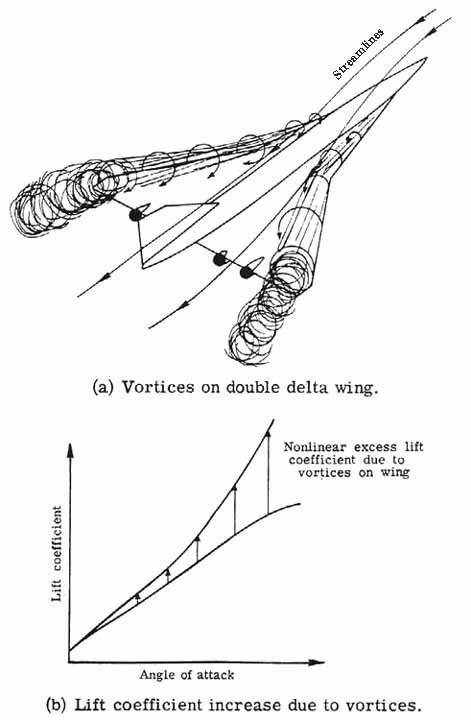 Regarding the angle of wings, yes, the wings in FLX are pointing downwards, which increases roll instability, and thus improves roll onset and roll rate. RE: canards and tails, a lot depends on the aircraft instability. When pitching nose up, canards will create upforce and tail (or flaperons) downforce. But once angle-of-attack stabilizes, effect varies depending on whether aircraft is stable or unstable. If aircraft is stable, nose will have a natural pitch-down tendency. Countering this by canards will increase total lift and thus turn rate, and countering it by tail will decrease turn rate. On the other hand, unstable aircraft will have natural pitch-up tendency. In this case, canards will have to provide downforce, decreasing lift and turn rate, while tail or trailling edge control surfaces will have to provide upforce, increasing lift and turn rate. “Nose canard” is kind of like saying “animal horse”. Now, long-arm canard such as that on Eurofighter Typhoon is a control surface. It controls aircraft pitch, and what I wrote before fully applies to it. Close-coupled canard such as that on Dassault Rafale, Saab Gripen, Saab Viggen etc. is a lifting device, albeit Rafale’s and Gripen’s canard is also a control surface. This means that its main purpose is increasing lift in turn, whereas its utility as a control surface, while extant, is of secondary importance. I’d read those before, with only semi-understanding of the aerodynamics argument. Thank you very much for these last two posts which clearly explain the concept. – Would it look somewhat like the Su-27? Or perhaps a canard delta version of one? – Would it even be worth putting radar? A command fighter might be the ultimate platform to put a large IRST. This could be combined with the idea suggested before of using large airships. The large SU-27 like aircraft would have an even higher fuel fraction with no radar. I’ve suggested such an aircraft before. It would not have the transient performance of an FLX, but it would be fast and have longevity. The command variant would be a 2 seater, and a dedicated bomber interceptor would be 1 seater. The interceptor could double up for taking on enemy transports, tankers, maritime patrol aircraft, and other large targets, or it could be used as a tactical bomber (a much better bomber than an F-35 IMO). You can’t put a too large IRST because of aerodynamic concerns. And radar does have its uses, however limited. And yes, it likely would look like Su-27. Actually I think something the size of the Su-27 is big even for a command fighter. In my opinion a two seat Rafale would be the perfect command fighter, with some modification of course. First of all either switch to a swash-plate AESA radar as the Raven on the Gripen E/F or use multiple AESA panels for spherical coverage, it would be expensive but hey this is a command fighter one is not going to build a lot of them (maybe a maximum or 4 per squadron of 18+aircraft ?). Second: development of two types of conformal tanks similar in concept to the FAST packs of the F-15, that is tanks that allow not only the carriage of fuel but also add weapon hard-points. The latest version of the FAST packs if produced would allow the F-15 to carry 24 AMRAAM’s. One of the packs developed for our Super Rafale would be the air-to-air pack that each would add 6 conformal air-to-air missile hard-points for a total of 12 to compensate for the loss of two or four wing and body hard-points. The other pack would be the Strike Pack that would each have fuel and an enclosed weapon bay and would be shaped to reduce RCS. That would be for the penetrating bomber role that Altandmain suggested. Both types of packs would be carried conformal to the fuselage under the wings and would be dropable, so that once the fuel and weapons are used and the fighter is in danger it could jetison them for a boost of speed or maneuverability. The third modification I was thinking would be the envelopment of a wing tip hard-point or pod that would allow the carriage of at least 3 dog-fight missiles on each wing tips for a total of 6, that would be designed such that the baseline aerodynamic configuration of the Super-Rafale would be with the two pods fitted. This pods would be used both in air-to-air and strike missions so that even an Strike Super Rafale would have at least 6 dog-fight missiles. With this modifications I think a notional Super-Rafale would have range superior to a Su-27 type aircraft at half the weight and fuel consumption and thus cost of operation. Let’s not forget that the Su-27 is big not just because of range requirements but because Soviet Engineering had a hard time tminiaturizing the needed avionics and the engines where not as efficient as Western modern engines. For comparison the Su-57 (PAKFA) is smaller then the Su-27 while having the same subsonic range and supercruise range bigger then the range of the Su-27 at sea level and having two extra hard-points. Rafale is capable of utilizing cheek radar arrays, not sure if AdlA has their development planned, though. Rafale’s conformal tanks are carried on its upper surface, so there is no need for weapons hardpoints as they do not negate the use of any hardpoints to begin with. That being said, dual missile rails, possibly combined with external fuel tank pylons, would be a good idea. That way, Rafale would be able to go into combat with a total of 5 fuel tanks and 16 missiles. Well I was not thinking of the current Rafale but a notional future Super-Rafale. Frankly for me conformal tanks are an immature technology because they are not dropable. My opinion is that any external tank conformal or not should be dropable. Therefore the next avenue of research for conformal tanks should be conformal drop tanks. So the current fashion of adding humps to the F-16, Typhoon and Rafale is a technological dead-end. Let’s be serious to install those tanks one needs a crane. So a conformal tank is a permanent fixture in this case which takes away from the flexibility of the design. If the fighters for example needs to take-off quickly for a point-defense mission, close to the base where extra fuel is not needed, it would be forced to fight with the penalties associated with conformal tanks and none of the benefits. Compare this with the FAST packs of the F-15, that are placed under the wing and are as easy to load and unload as any ordnance. This gives the F-15 incredible flexibility. 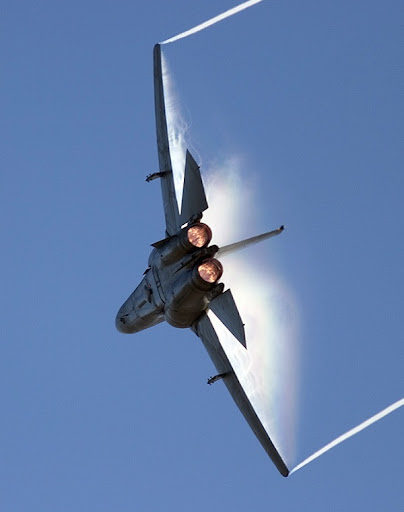 For example F-15 C/D which already have huge range normally operate without FAST packs. But when they operate from Iceland they usually carry them if it’s not a short mission. They also use them for ferry flights. F-15 E on the other hand fly almost always with the FAST packs. For the F-15 FAST packs are mission ordnance to be loaded as needed not a permanent fixture as the conformal tanks of F-16, Typhoon and Rafale. Also another interesting thing about the FAST packs of the F-15 is that they can reduce RCS if designed so, as in the Silent Eagle proposal. The only negative about the FAST packs is that they are not dropable. So that is why I was proposing new conformal tanks for the notional Super-Rafale not the crappy humps it’s supposed to get right now. And i was proposing two designs. A skinny streamlined one, with external weapons, that would not impede super-cruise, for air-combat, and a fat RCS reduction shaped one with internal weapons for strike mission. Both designs in my view should be dropable, therfore should be placed under the wing. Once the fuel and weapons are spent the pilot should have the option to jettison them. This might be necessary in both A-to-A and A-to-G mission for the fighter to enter a dogfight, either as part of a merge in Air-Superiority or to get rid of pursuers and escape for a strike mission. Conformal tanks are mostly to increase range in ground attack missions without sacrificing hardpoints or causing too much induced drag, so they do not need to be droppable. Not exactly a dead end, but not an optimal solution either. They are not a permanent fixture, however, so it does not need to be used in point defense missions. F-15-style conformal tanks are superior in that they are easier to load, and IIRC may not even sacrifice hardpoints because they have hardpoints installed on them. But to my knowledge, even underside conformal tanks are not droppable like drop tanks are. They are not properly shaped for it, and even if separation mechanism could be designed, conformal tank risks flying straight back into the aircraft dropping it. I think the best option may be to build a family of fighters. Actually this “family” may very well resemble what the Su-27 family has become in some regards. Some would have radar, some would not. I had considered a command fighter, but maybe something like Gripen NG is the best option. I’d propose that the better design is a Gast principle operated twin barrel cannon like the Gsh-23. It has much higher fire rate, simplicity compared to revolver types and reliability. You could chamber it in 27mm Mauser or any other round, the soviets used 30mm in the Su-25. Yes, GSh-23 seems to be a good design, but muzzle velocity is too low. Well that comes from the ammunition used 23x115mm which is derived from the 14.5x114mm round. That means it has only slightly more powder for twice the mass and therefore is under-powered. The round precedes the gun and the gun was probably designed based on the dimensions of the cartridge. There is no reason why it could not be redesigned. For comparison the other Soviet 23mm round is the 23x152mm round that was used by the Il-2. It has more the 200m/s more muzzle velocity. It’s hard to compare to western rounds because Western countries have not used 23mm rounds since WWII, but a re-chamber to 27mm might be a good idea. Or maybe why not try to go for 35mm or 40 mm? I do believe a 2 barreled Gast gun might be lighter then an equal caliber revolver gun because of using a simpler mechanism with less moving parts. And offers better heat management because of the 2 barrels. Another thought to consider: could a Gast-gun be built with more then 2 barrels? Agreed, all good ideas. And any gun can be built with any number of barrels, but with the exception of Gattling type guns, each barrel has to have its own firing mechanism. But that would be inefficient. The soviets got 3600 rounds per minute out of it in 1965 for a mass produced version, I imagine that applying modern high-end materials and production technologies can increase that number significantly. For example the single barrel GIAT 30mm nearly doubled the rate of fire of the DEFA 550 cannon it replaced (from 1300 to 2500 rpm) and even did that with a much more powerful and faster round! I’ve always thought that the concept of wingtip missiles was a little bit off. If the plane is designed around them, then you really should never have them leave the aircraft. And you should especially never have one be fired and the other stay put. What do you think about the concept of putting IRST on the wingtips instead? It seems to have a few benefits to me. First of all, it improves the aerodynamic qualities of the top of the nose and may slightly increase the pilots visibility, because there is no IRST there anymore. Secondly, it can provide you with binocular vision, which solves the biggest problem with IRST, range finding. Thirdly, on the back you can put additional IR MAWS or UV MAWS, which can supplement or possibly even replace the MAWS on the tail, essentially for free aerodynamically. It is not so much wingtip missiles, but rather wingtip missile *rail* that has main impact on aerodynamics. Of course, adding or removing a missile will affect aerodynamics, but not so much that it will really matter. Full-sized IRST is way too large to fit on the wingtip. An IR MAWS may be a good idea for that, it doesn’t take much space, but issue here is that wings have to be elastic. This means flexing under aerodynamic pressures. This in turn means that you will not be able to do a good range estimate, or even direction estimate, without a (likely very expensive) system to compensate for the flexing. Ah. Thank you so much for this. That’s quite unfortunate though. Guess we’re stuck with the unaerodynamic nose IRST. Do you know how much drag that produces or is it quite minimal? Also, do you think that there may be a place for wingtip FLIR on a CAS plane? I just ask because building it into the airframe seems dangerous and stupid, considering that it will only last until it is fired upon once. I don’t think it produces much drag. You will notice that aircraft that had no IRST still had an IRST added, typically in an assymetric configuration. That would have been impossible if drag was significant. IR sensors are actually quite difficult to jam, as you need to hit them with IR laser covering the entire frequency range. So I do not understand what you mean by “it will only last until it is fired upon once”. I mean it will only last until the bullets it gets riddled by totally destroy it. I mean it’s basically a type of camera, so there’s no such thing as a bulletproof IR sensor. This isn’t such a problem with the fighter plane, just because I don’t envision nearly as many bullets getting fired into the things. Nothing to do with jamming at all. I figure that it’s probably a maintenance nightmare to fix a FLIR that breaks inside of the nose, much more so than simply replacing the FLIR on a wing. Also, the second FLIR on a CAS plane acts as redundancy. So for those reasons wingtip FLIR seems more appropriate, but it’s a small thing. Frankly, I don’t think there is much need for IRST/FLIR on CAS aircraft at all. They typically fly very low, so at ranges you are looking at, you can use night vision googles, or maybe have HMD connected to IR MAWS so as to allow 360* day-night awareness for the pilot – possibly even through the hull. When FLIR/IRST is needed, just slap on a pod and that’s it. Well my thinking was that, especially here in Canada, but really anywhere in the wintertime, anything hot is going to stick out like a sore thumb. Not strictly necessary, but could be very useful. That’s another reason though to have them on the wingtips, so you can replace them with something more appropriate for any mission. Having said that, you may well be right that, at low altitudes, an IR MAWS with 360* coverage would be good at picking up those things anyway. F-15 E on the other(a) paw tent-fly almost always with the FAST packs. 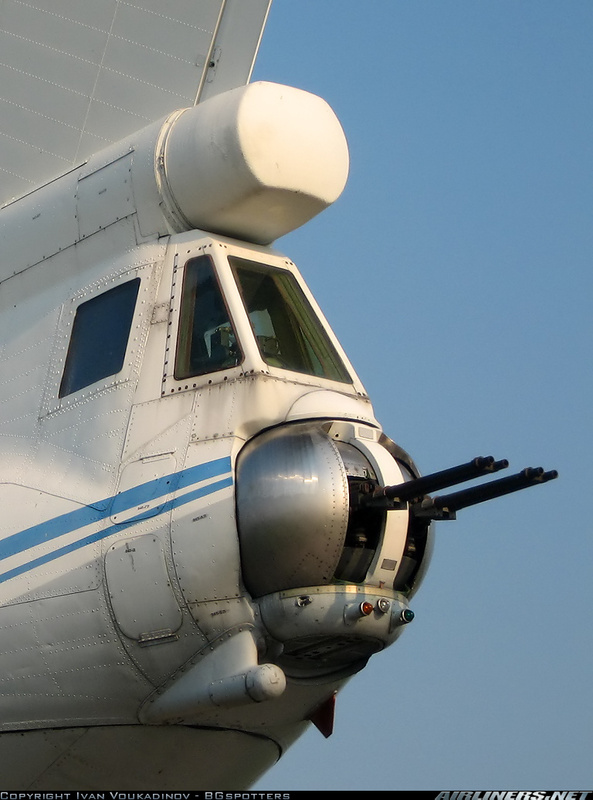 No,It can’t be built with more than 2 barrels, but you can hold two separate cannons along each other(a), like in the IL-76 turret — <a href="http://imgproc. Picard, I’m thinking more and more that the USAF really needed to build an upgraded Strike Fighter. I know that the F-35 is called the Joint Strike Fighter, but I mean an actually good one. I wish I could find you the website now, but I read that the A-7 had a range on internal fuel of almost 5000km, and the Greeks would fly the things 8000km’s to America, albeit with fuel tanks. The A-7 was capable of pulling 4.3G’s sustained turning performance, as compared to the F-35’s 4.5G’s. I’m having trouble finding the climb rate but I bet the F-35 beats it there, since the thing had a T/W ratio of less than 0.45. Having said that, the plane could carry over 20,000lbs of ordinance, compared to the 18,900 lbs of the F-35. Where am I going with all of this? Well I think one of the problems with people who design vehicles, especially airplanes, is that they try to make them good at doing anything. The F-35 is a true Frankenstein’s Monster, but pretty much all modern fighters suffer for also being turned into an air strike platform. It can’t be all that hard to build a great modern, subsonic fighter plane. If you can build some cross between the A7 and A10 you’d have a hell of a plane on your hands, for doing dedicated air strikes and Heavy CAS. I’ll expand more upon this. High altitude Interceptor- Used for intercepting bombers, flying behind enemy lines and destroying cargo planes, fuel tankers, AWACS. True Fighter – Used for destroying or at least distracting enemy fighter planes. Strike Fighter – Executes called in Air Strikes (flying artillery). Best plane to hunt down enemy ships. -Huge payload (for fighter), great range (for fighter), very maneuverable albeit underpowered. Destroyer (Heavy CAS) – Can somewhat patrol an area for the troops, but mostly gets called in. Also carries huge payload. Called in after enemy found, or where it’s extremely likely that concentrated forces will be. -Warthog with bigger gun, larger payload. CAS (main) – Fire support for infantry/tanks/artillery. Scouting on the battlefield itself. Scout/FAC – Finding enemy forces, but not to be used in high threat areas. Used to scout flanks and wilderness areas. -Build something very close to an A-10/A-7 cross. An armoured, more maneuverable A7 would be fantastic. Alternatively, a less maneuverable but much faster A10. -Something like a cross between your ALX and OLX. I suggested building the ALX with turboprop engines and making it smaller and it would fit just perfect here. I say all this because I think that a country could do a pretty damn good job with just these 3 combat planes, but that you can build a much better Fighter/Interceptor and CAS/Scout plane if you focus on just doing those missions, instead of designing a plane to do all three of Fighter/Interceptor/Strikes and Destroyer/CAS/Scout. The fighter will be saddled with unnecessary avionics for air to ground, in addition to excess wing thickness and weight. The CAS plane with be unnecessarily large and fuel inefficient. Additionally, probably most importantly. Fighter planes should be single seat. CAS and FAC planes should be single seat. Strike/Destroyer planes should be double seat. So right there it sort of requires its own design anyway. I say all this to point out that balancing a fighter is something you have to do a lot less of if you’re the US, because you have so much money that you can get economies of scale with a whole bunch of specialized aircraft. 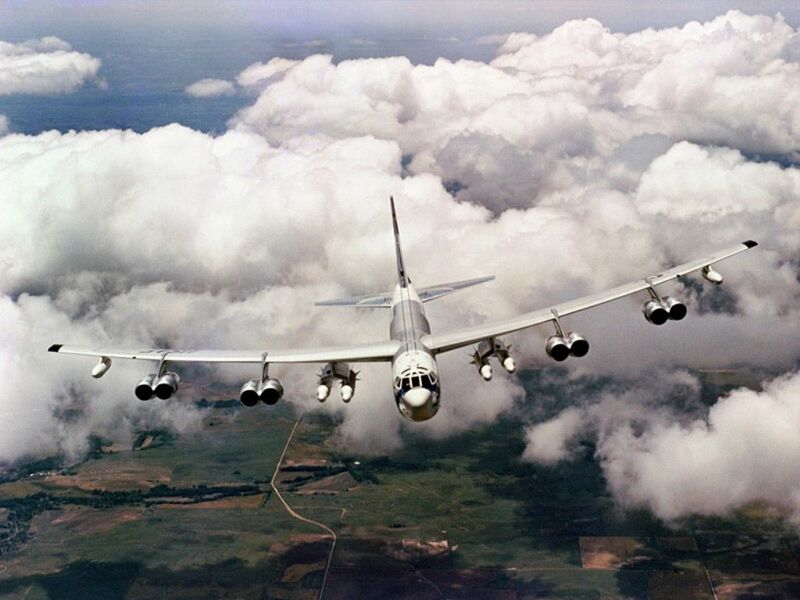 Of course, the US is also the worlds leader in making ridiculously “multirole” aircraft that are crippled in their roles, but the principle remains. 1) FLX is a defensive design. Maneuverability and size are a must. Reason why I wanted high fuel fraction (0,4 at least, I achieved 0,44) is a) it was needed for supercruise requirement, and b) I wanted to achieve as long range in as small aircraft as possible, so as to allow it to carry out offensive missions as well. 2) Strike fighter is expected to perform in air combat as well. So you would be looking at something like Panavia Tornado, Harrier or F-35. What you have described is not a strike fighter, but strike aircraft. 3) Do turboprop engines provide enough thrust? And if they do, why are turbofan engines so widely used for CAS aircraft (A-10, Su-25)? I designed CAS and FAC aircraft to be twin-seat because they are expected to double in their missions. CAS aircraft is expected to perform FAC if air defences are too dangerous for prop FAC to do it, and FAC aircraft is expected to perform CAS mission in COIN situations. And my designs were not meant just for US, but for Europe as well. 1) Yeah the FLX is a little bit of a compromised design, which seems to be going for that 90% area between perfect Interceptor and perfect Fighter. I think that it’s a very intelligent design (on paper), which is absolutely right for many countries. 2) As I expanded upon below, the strike fighter does do air superiority, although mostly against everything other than fighters. It’s the mop-up plane and can be outfitted as a command fighter. A modern, better, A7 is my idea. 3) Well we’ve been over this. Big enough engines and definitely yes, especially at low altitudes and low speeds, but all of this depends on where you want to land on the (fuel efficiency/thrust) spectrum, with medium bypass turbofans providing clearly more thrust, although diminished at low speeds. All of these planes have some bleed over into the others, although there’s a bigger gap between my destroyer concept and the strike aircraft, with there essentially being two groups of three, Fighters(Interceptor, Fighter, Strike) and Attackers(Destroyer, CAS, Scout/FAC). My ideal solution for Canada would be, considering our budget, something like your FLX, but possibly with more range and speed sacrificing small amount of maneuverability (just cause it’s Canada), combined with my take on your ALX (turboprop engines, smaller overall size and payload), that would hopefully be an adequate solution in all three Attacker roles when called upon. Combined with not idiotically retiring the F18, and using it as a command/strike fighter, and I think that’s something approaching an 80% solution, provided enough of the planes are built. Other countries in different political, geographic, militarist, and financial situations would probably be extremely happy with your FLX, ALX, OLX combo, which I think is a pretty great place to start for all nations. Agreed. My FLX/ALX/OLX mix is mostly for European defensive scenario, but it would work for other countries. For Canada specifically, I would mix FLX and F-15E, due to its size; FLX for local defense and F-15E for patrol and as a command fighter. Anyway, to expand upon my A7, A10 cross. The main problem with the A10 is that the plane is frankly not very good at the scouting role. It’s far too fuel hungry to be used as a scout, and as I’ve mentioned previously, they never built enough of them in the first place. Those two things combine to make for a plane that rarely gets brought along “just in case”, and instead usually finds itself responding to an emergency. However, I think that’s totally fine, but if that’s how the plane is going to be used, then the plane needs to be designed a little differently. The US sorely misses the A7, or a plane in the style of the A7. It wasn’t a particularly great CAS plane, but the navy would have gotten tons of usage out of the things hunting down enemy ships, had there ever been a real war. Anyway, both of these planes are 50 years old at this point. This may be technically unfeasable, or simply impractical for some other reason, but I’m going to run this concept I have by you and see what you think. Take the A10, and install two higher power, lower bypass ratio engines in the thing. Improve the design so the whole thing is lighter, and use that extra weight savings to install a 35mm autocannon and increase the wing payload. The A10 currently has a maximum speed of 706 kmph, and a cruise speed of 560 kmph. With the increased power of the engines let’s say you have a plane that cruises at 800 kmph. I think you now have a great Strike/Destroyer hybrid aircraft to replace the A10, with more of an emphasis on the Destroyer part. Sure, this exacerbates the A10’s flaws, but, like I said below, not every plane needs to be perfect at doing everything. Alternatively, take the A7 and armour the thing against small arms fire. Increase the payload, and give it more than an M61 Vulcan 20mm cannon. Make the plane more maneuverable at low speeds. If you could do all this while keeping the range the same (or increasing it), you’ve got a fantastic Strike/Destroyer hybrid with a focus on the Strike part. I usually like to give more detailed and realistic proposals, but I don’t know how feasible it is to make an A10 that fast with the same basic airshape. Also, I’ve heard Pierre Sprey himself talk about how he thought the A10 could be made (much) smaller even back in the 70’s, but I don’t know for sure how much smaller we can make it. Your “modified A-10” proposal would result in an A-10 that has greater TWR (and thus acceleration and climb rate), greater firepower, but less endurance than current A-10. It would perform well in your “destroyer” concept, but issue is that CAs fighters often need to loiter above the troops (look at A-10 missions in Middle East, they typically remain on station even after insurgents leave). And lower-bypass engines would damage that ability. It could supplement the A-10 very well, but it could never supplant (replace) it. A-7 proposal OTOH would be very good, but I have issue with it performing CAS missions (bad cockpit visibility due to cockpit design and high wing, issue with rearming the aircraft due to high wing, vulnerability due to single engine). It simply is not a CAS design. A-10 could have been made much smaller, that is what I did with my ALX proposal. I might have overstated ALXs combat radius somewhat, but other than that, it should be accurate. Well I completely agree that my destroyer concept would have issues with persistence, but that’s why you build a bunch of more specialised planes. My idea for the USAF would be to build something very similar to your OLX, ALX, but also a plane the size of the current A10, but with a much larger cannon (maybe even the bofors 40mm or something), plus much increased payload, and the same or greater maneuverability. The entire point would be to call in the plane only when things are already bad on the ground, or when you have a good idea that things will soon get very bad on the ground. Something similar to the ALX would be the mainstay CAS of course, and I would also build enough of the things that there would always be some with the troops before even being needed. There are still going to be times when you can make fantastic use of the enourmous firepower of my Destroyer. As for the improved A7, I very much meant emphasis on the strike part. It’s CAS would consist of loading up with a bunch of CVR7’s and unloading them onto the (hopefully) correct area with a high altitude gun run to boot. Very much not something that you do near the troops on the ground, but of some value nevertheless. Not meant to replace an actual CAS plane in the slightest. The main benefit would in hunting for enemy ships, and in that role I think it could excel. Also, of course, it can perform air strikes with conventional weapons for the troops, which is somewhat overrated, but can be of some value regardless. Given numbers and pilot skill, the plane can defend itself just fine against enemy fighters, and can absolutely clean up against everything else that flies, so it’s very useful in air superiority as well. Finally, I envision this aircraft in the same role as the F18 Growler (btw, the F18 is a strike fighter realistically). So they’re very much different planes, and my point was just that the USAF doesn’t need to make these hard decisions as to which one it’s going to build. They have over 2500 fighter planes now and they constantly complain as to how few they have. The economy of scale exists to produce much more than the 6 different combat aircraft types I’ve listed here. I wonder if there will be more where that came from. Yeah the F35 program is a total joke, but we already knew that. It’s just kind of frustrating that it’s such a financial boondoggle, that people get the impression that it’s a good airplane except that it’s too expensive. People are sometimes unable to understand that more money sometimes equals less product. You also have to remember that humans are emotional, not rational, beings. Being a Croatian and not an American / British / French / Russian gives me a very different perspective. Many people believe that F-35 is good simply because it is “Made in USA”… same goes for Russians with PAK FA, French with Rafale etc. For my part, I don’t like any of them very much, but I do believe Rafale is the best of the bunch. But my personal favourite would be Gripen A with IRST and IR BVRAAM. Yes, and as a Canadian I feel somewhat the same. It’s very hard for me to be objective when evaluating the F18, for example, because it’s what we’ve flown since the 80’s. Having said all that, I’ve also had reason to research objectively the fighter planes considered for the replacement, which lead me to your site. … would be a 55% good enough solution. It’s very frustrating that this is such an easy, if not ideal, solution is well within the reach of our hideously corrupt politicians. Yes, that would be a good option. It would in fact cover most important of CAF requirements: namely, air policing and COIN. BTW my point was that if I struggle to be objective over the F18’s, then I can see how people aren’t objective over planes that their country designs and builds. Actually I’d be quite interested in hearing about your ideal composition of combat aircraft. I know that you don’t have necessarily all that much knowledge about the proper design of cargo aircraft, but I wonder, if you had the close to unlimited budget of the USAF, what would you build? 1) is it tactical or strategic transport? As far as generalist transports go, I am quite a fan of C-130 and A400M.